Carte Generale De L'Amerique Septentrionale Avec les possessions Angloises dans cette partie du nouveau monde, Dressee sur la carte de Pople, publiee a Londres en 20 fuilles, pour servir a l'intelligence de la guerre presente. An attractive example of the c. 1756 Crepy edition of Popple's Key Map. One of the two most important maps of North America issued in the 18th century, Popple's map covers from the Hudson Bay to the Spanish Main and from the Rio Grande to the Grand Banks. Seventeen detail city and port plans appear in the lower right quadrant of the map. This map is, as its more common name 'Popple's Key Map' suggests, a key to assembling the separate sheets of Popple's massive wall map of the same region. The Popple map and its associated Key Maps were originally issued in London around 1733. Several subsequent reissues by various cartographers followed, including a 1746 French edition by Le Rouge upon which the present key map is based. In 1756 the French map publisher Crepy acquired the plates for the key map and being publishing his own variant - of which this an example. In this edition, published more as an independent map than as a key to the larger wall map, the numeric indicators intended to identify the 20 sheets of the larger map, have been removed. Nonetheless, the original sections as defined by dark black lines, remain apparent. Popple's map proved highly influential, being the largest and most detailed map of North America yet published. Popple was a clerk the Board of Trade and Plantations. His great map was commissioned by the board with the intent to be displayed at various offices throughout the colonies. The map was compiled by Popple and Clement Lempriere, an accomplished cartographer whose own work, particularly in the Bermudas, is admired independently. Originally the Board of Trade no doubt hoped that Popple's new and presumably accurate mapping of North America would help resolve disputes related to rival expansions of English, Spanish and French colonies. Popple complied his map from the best sources then available, including Colonel Barnwell's Map of the southeast, Delisle's 'Carte de la Louisane,' and Cadwallader Colden's map of the Iroquois Nations, among others. The consequent vast map illustrated North America at a level of detail and precision never before seen. However, since the map extended well into lands claimed by the French, French maps were often superior. Popple not only copied the French geography, he also managed to copy some of the French agenda border configurations. Consequently, much of Popple's cartography failed to fully support the Board of Trade's colonial ambitions and the map was never approved by that group. Nonetheless, as the first large scale British mapping of North America the Popple map proved enormously influential and was copied widely by other cartographers of various nations. Copies are recorded in the collections of such luminaries as George Washington, Thomas Jefferson, John Adams, and Benjamin Franklin, to name but a few. The map was ultimately used by both French and British officers in various treaty negotiations, including those at the end of the French and Indian War. The Popple map was eventually superseded in importance and accuracy by the John Mitchell map of 1755. The map features many unusual elements. One such is the large and curious lake filled with islands located to the west of the Mississippi on the Moingona River. This is a remnant of Lahonton's Long River and Salt Sea. Lahonton was a French military officer commanding the fort of St. Joseph, near modern day Port Huron, Michigan. He lived for a time local Chippewa tribes, Lahonton claims to have explored much of the Upper Mississippi Valley and even discovered a heretofore unknown river, which he dubbed the Longue River. This river he claims to have followed a good distance from its convergence with the Mississippi. Beyond the point where he himself traveled, Lahonton wrote of further lands along the river described by his American Indian guides. These include a great saline lake or sea at the base of a mountain range. This range, he reported, could be easily crossed, from which further rivers would lead to the mysterious lands of the Mozeemleck, and presumably the Pacific. Lahonton's work has been both dismissed as fancy and defended speculation by various scholars. Could Lahonton have been describing indigenous reports of the Great Salt Lake? Could this be a description of the Missouri and Columbia Rivers? What river was he actually on? Perhaps we will never know. What we do know is that on his return to Europe, Lahonton published an enormously popular book describing his travels. Lahonton's book inspired many important cartographers of his day, Senex, Moll, Delisle, Popple, Sanson, and Chatelain to name just a few, to include on their maps both the Longue River and the saline sea beyond. The concept of an inland river passage to the Pacific fired the imagination of the French and English, who were aggressively searching for just such a route. Unlike the Spanish, with easy access to the Pacific through the narrow isthmus of Mexico and the port of Acapulco, the French and English had no easy route by which to offer their furs and other commodities to the affluent markets of Asia. A passage such as Lahonton suggested was just what was needed and wishful thinking more than any factual exploration fuelled the inclusion of Lahonton's speculations on so many maps. The present example replaces the Longue River with another river, the Moingona. The city he identifies on the shores of the lake, Esanapes, refers to a 'numerous and powerful' American Indian nation who he did not meet, but who were at war with the Ekoros, who though not identified here, Lahonton supposedly did meet. The Moingona itself is a river that began appearing on European maps following the expeditions of Jacques Marquette and Louis Jolliet, who identify the Moingona as a tribe. The association of the Long River and the Moingona River is no doubt Popple's attempt to reconcile the widely believed exploits of Lahonton with the factual travels of Marquette and Jolliet. This map features a decorative title cartouche in the lower left quadrant. The cartouche features an American Indian Queen in a tropical setting resting her feet on an Alligator and a human head while parrots and moneys frolic in the background. To either side of the cartouche proper an American Indian Warrior and a mother look on. In the background, we can make out Europeans smoking pipes and lounging on bales of trade goods. Tobacco plants border the cartouche on the right. A three-masted sailing ship lies in wait just offshore. Henry Popple (16?? - 1743) was a British cartographer active in the early part of the 18th century. Popple was a clerk with the Board of Trade and Plantations, the organization that governed Britain's colonies in America. With his father, grandfather, and brother all being employed the board of trade, the Popple family had a long history of association with the British colonial administration. Popple received his commission as a clerk at the board of trade in 1727, but resigned in the same year. Curiously this is the same year he began work on his signature production, the Popple of North America, he resigned from the board to take a position as the Cashier to Queen Anne. Nonetheless he continued to work on his great maps and a manuscript version of the Popple Map appeared in this very year. Subsequently, Popple continued to update and refine the map until 1733 when it was finally printed. The Board of trade intended the Popple map to be a British response to Delisle's French mapping of North America, which presented boundaries that conflicted with British colonial ambitions. However, since Popple in fact based much of his map on Delisle's superior cartography, he also managed to copy many of the French political boundaries - to the detriment of the Board of Trade and its expansionist intentions. 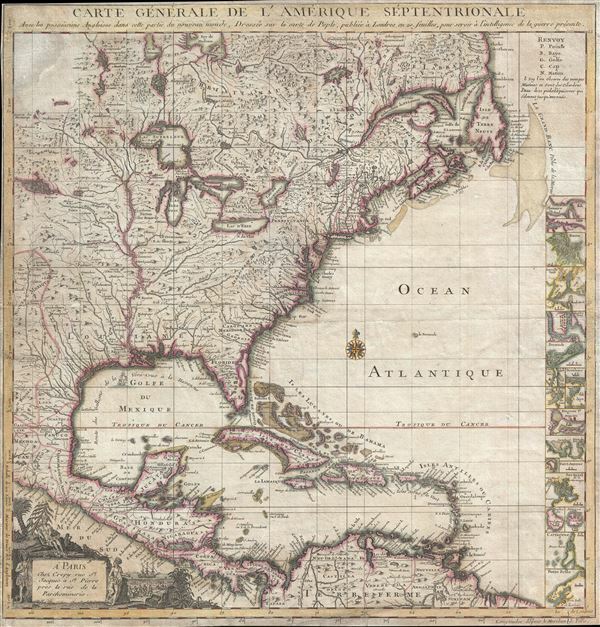 Although Popple's map was never approved by the Board, examples were rushed to each colonial governor and the map played a significant role in the cartographic history of North America. Popple cartographic endeavor began and ended with this singular map however, it significance was such that he must be considered in any list of significant British mapmakers. Good. Margins narrow but intact. Moderate toning. Goss, J., The Mapmaker’s Art: A History of Cartography, 55.